We are excited to be offering this set of 14 sample handmade papers of all of the pulps and fibers that we offer. 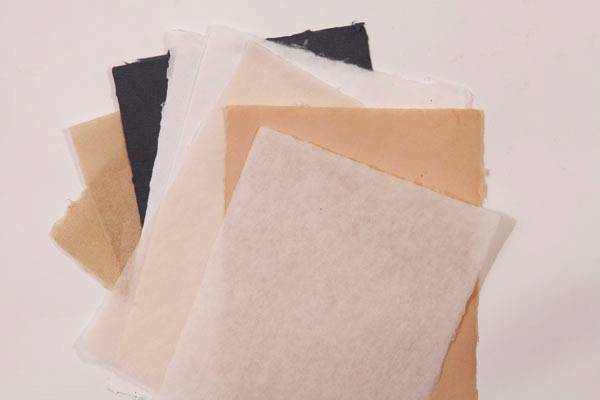 Each 6" x 8" sheet is made by us at Carriage House Paper and is labelled with the name of the pulp or fiber, preparation technique, beating time, and drying method. The sheets come in a specially designed handmade paper folder for safe keeping. This sample set of papers is perfect for anyone who is wondering what the finished papers made from this pulps & fibers look like. It is helpful for those of you who wish to follow our formulas in order to get similar results. And it is invaluable as reference material to any teaching facility.